Framos has launched a complete product line for embedded imaging at the Vision trade fair, which was held in Stuttgart, Germany from 6 to 8 November. The series of products includes sensor modules, module board adapters and processing board adapters. The embedded vision products are the first devices Framos has manufactured directly. It represents a new direction for the company, which has up until now only distributed components from other vision suppliers. 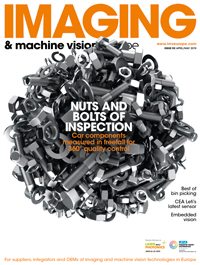 Speaking to Imaging and Machine Vision Europe at the trade fair, Dr Christopher Scheubel, head of IP and business development at Framos, said the embedded vision product line was a strategic decision to address the changing machine vision market. He noted the previously separate worlds of industrial and consumer imaging are now starting to intersect. Embedded vision, in theory, lowers the cost of entry for building devices with imaging capabilities. Powerful computing boards open up the possibility of integrating vision on devices, which wasn’t an option previously. Scheubel said that an engineer could buy a Framos board for as little as €12, although he said that a more comprehensive system could cost up to €500. The Framos embedded product line provides vision engineers and developers with a number of components to accelerate building a vision system. Among the range is the FSM series of sensor modules, made of pre-existing Sony and On Semi sensors on a PCB with a standardised connector. The module footprint is 26.5 x 26.5mm, connected via a Hirose 60pin on the bottom side and equipped with four holes for mounting the FSM. There are two M12 lens options available as well as a broad range of sensors from VGA resolution up to 12 megapixel. Also available are the FSA series of sensor adapter boards, which can translate image data, regardless of the sensor interface, into a common signalling interface through a standardised Framos connector. The FSA adapter boards are designed to work with both Framos and third party sensor modules. Finally, the Framos FPA series of processor adapter boards open up the sensor module portfolio to work with a number of processor development boards, such as Nvidia Jetson TX2 and Qualcomm DragonBoard, to name two.